It was always interesting to know how much damage you nastrelyal directly in combat. 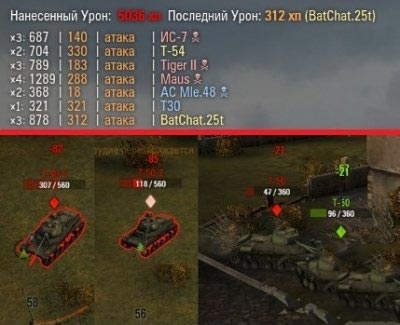 The damage mod at the top of the screen World of Tanks 0.9.15.0.1 shows the total amount of damage caused by you in battle. Copy the contents of the archive in: / WOT /. How to install the counter on top of the damage already installed? If you want to set yourself up only the configuration of the counter the damage to the already established copy the file \ res_mods \ configs \ xvm \ hitLog.xc from the archive in the WOT \ res_mods \ configs \ xvm \ [your config] \ hitLog.xc, confirming a replacement. Where is [your config] — the name of the author config (if the folder WOT \ res_mods \ configs \ xvm \ you do not have any more folder, then copy the file hitLog.xc right there).